Looking for the best home weather station? I guess you wouldn't have arrived at this site if you're not. Well, if you're able to pay a little over US$300.00 your search is over. It's the Davis Vantage Vue Home Weather Station , and here's why it will probably set the standard for home weather stations. Most importantly, it simply outperforms all of its competitors, both overall and in individual components, and it costs very little more. Secondly, it is based on the excellent Vantage Pro2 from Davis Instruments - the current standard for reliable and affordable home weather stations. In fact, the Vantage Vue is just a slightly scaled down version of the Vantage Pro2, with identical specifications and fast update times, and full computer compatibility. But with a price tag US$200.00 cheaper than the Vantage Pro 2, something must be missing. And that's true, but not anything important to the operation of a fine home weather station. You won't be able to hook up your Vantage Vue to some of the more specialized sensors that are optional with the Vantage Pro2, such as leaf wetness, ultra violet intensity and soil temperature, but you don't need them for standard weather observations. You also don't have the option of a fully ventilated temperature sensor, and there are "only" 22 alarms - less than the VP2 but still many more than the competition. All alarm triggers can be set from the console. And the forecasting function only covers a 24 hour period instead of 48 hours, but I think that most of us could live with that. Both the sensor module and the console are new designs, and the weather station is really easy to set up. So to sum up, Davis have basically stripped back the Vantage Pro 2 to provide all the essential features of a home weather station without any of the options that only more specialized observers require. They have also stripped $200.00 from the recommended price, which effectively means that you can get one delivered for less than $350.00 from many retailers, and as more become available I suspect the price could fall further. The only reservations I have about the Vantage Vue is that it has undergone significant redesign, and it is possible that a few bugs may appear as the months go by. Not a real concern, because Davis has a strong customer support section, and the weather station has a one year warranty on defects in material and workmanship. And while around US$300 - 350 is a very good price for a weather station of this quality, I realize that it may be more than you want at the moment, or is till priced higher than your budget may allow. Maybe next time. But for now, both La Crosse and Oregon make good alternative weather stations - not quite in the same class as the Vantage Vue but considerably less expensive. Many of these, if well maintained, will provide reliable weather information for years. 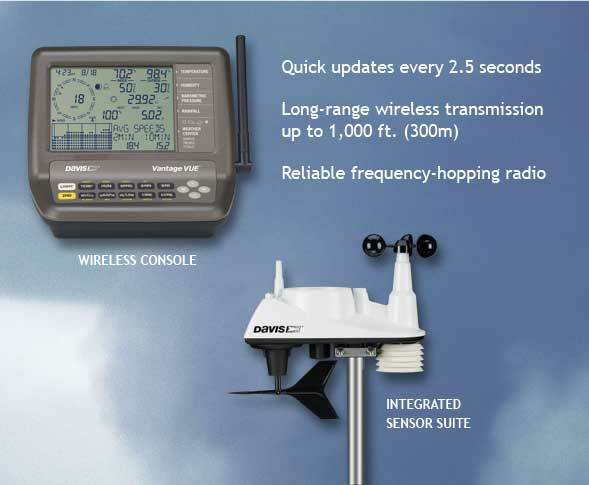 So until something better comes along, it is hard to recommend anything other than the Davis Vantage Vue for anyone looking for a fully featured, robust and reliable wireless weather station for home use. Visit the sister site Home Weather Station Reviews for more detail on the Davis Vantage Vue. You can find out more about other Davis Weather Stations by following this link. The Vantage Vue is still quite new, but it is becoming widely available through specialist dealers and over the internet. Different models are available to comply with radio transmission regulations in the USA, UK, Europe and Australia. You can find very competitive prices for the Davis Vantage Vue at Amazon and eBay (see real time bids for Davis weather stations below) - check to make sure the seller is a licensed Davis supplier. If you buy this or any other products from sites linked to these pages I may earn a small commission.